This year we presented two full papers at Ubicomp 2013. The two papers are available in our publications. Crowdsourcing on the Spot: Altruistic Use of Public Displays, Feasibility, Performance, and Behaviours. This work was mentioned in New Scientist and looks at using public displays as a crowdsourcing platform. Revisiting Human-Battery Interaction with an Interactive Battery Interface. This paper presents an application that helps to dramatically decrease power consumption on smartphones. 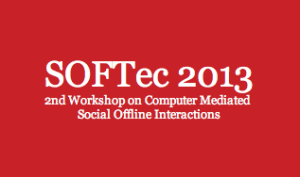 In addition, we co-organised 3 workshops: HiCUE 2013, SOFTec 2013, and UbiMi 2013.